This winter I bought three Google Home Minis—two for me, and one for my lovely parents. At home, my pair works like a deeply discounted Sonos setup. I can tell Google’s Assistant to play a song on “both speakers,” and it’ll pipe tinny, still-decent-sounding music into my bedroom and living room. At my parents’ house, I paid $29 for a goofy gift that, I hope, will ultimately help my mom listen to Paul Simon while she’s upcycling furniture. For the price I paid, I think my Minis were an excellent deal, at least until I grow sick of Google’s digital assistant. And I’m sure I will, but when that happens I can turn the microphones off and just use my phone to beam songs into the little cloth-covered spheroids. But people have good reasons to dislike these kinds of products. Some people distrust or fear them, mostly because of the inherent security risks involved with creating and maintaining a bunch of inexpensive, internet-connected, microphone-having devices. I opted in anyways, and paid money to do it, aware that Google will somehow use something I say one day to generate more money. I’m anxiously OK with that. In a way, this is just part of my job; to be fearful and simultaneously comfortable with subjecting myself to the internet of things. I may have forced the device on my parents by gifting it to them, but overall, it was my choice to seek out a little smart speaker. The way things are headed, however, I don’t believe that sense of choice will last much longer. As I sipped hot cocoa on my couch this January and barked orders at Google, my colleagues journeyed on foot across the convention centers of Las Vegas in search of some peek at the future. At CES, the trend was Amazon’s Alexa, Google’s Assistant, and Samsung’s Bixby, and how all those AI assistants have been plopped into not only speakers but Toyotas, TVs, a fridge, Tivo, mirrors, microwaves, ceiling fans, and so on. Smart assistants are not that powerful today. Or versatile. Or even that useful. But we’re reaching critical mass. Companies have shown they are intent on shoving them into whatever they can get their hands on—in the name of experimentation, as a gimmick to sell you, say, a smartened-up bathroom, or just in search of new ways to remain a central part our lives. This is worrying but it was easily anticipated. We saw a preview of the trend last year at CES, and smartphones have already made services like Siri commonplace. But unlike smartphones, internet-connected devices haven’t proven themselves to be nearly as secure. Even if that changes, is Alexa, Siri, or any other assistant really how you’d prefer to navigate much of your appliances at home? There are plenty more questions to ask—Will the things I use every day (my shower, stove, and milk frother) soon be designed in a way so it’s just easier to depend on an assistant instead of, like, pressing some buttons or turning a knob? Maybe you’re comfortable with one assistant—or two, but is it necessary to supply each nook with its own microphone? 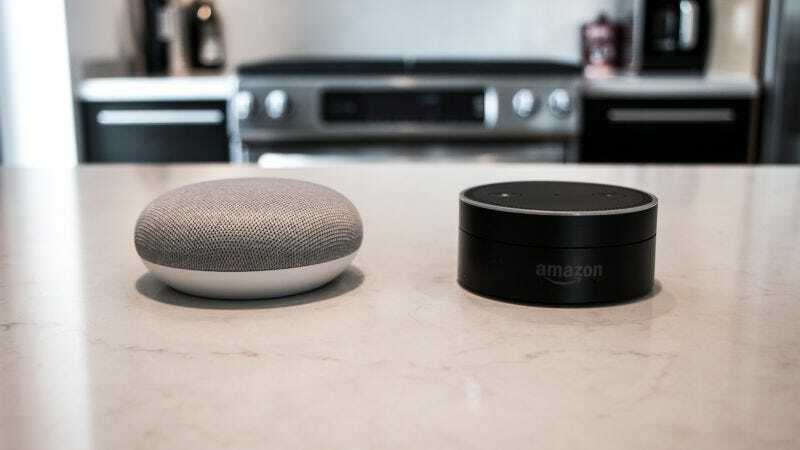 Is 2018 the year we’re going to start talking about smart assistant fragmentation, where one appliance requires Alexa, and the other something else? Is the real sell for Apple’s delayed HomePod simply that it’s not going to mine as much data from you for the purpose of tricking you into buying you something you don’t need? Of course it is. While smart assistants creep deeper into our lives, I’m willing to try every one of them. I’ll grimace and then give plenty of goofy, thought-provoking, and bad integrations a try as the tech is mushed into devices new and old. A smart assistant in a car, sure, that sounds like a good idea. A ceiling fan? Not really, but maybe. Yet recipes are best kept visual, microwaves work just fine with buttons, and no, I don’t ever want to ask my toilet to flush. The are plenty of other ways to interact with tech, good ways that often lead to a better experience for people. Let’s not forget that we have hands and we have eyes.